Black and white negative of James and Alice Sawdon sitting side by side on a bench. Both Mr. and Mrs. Sawdon have their arms crossed. There is a swing and fence visible in the background. 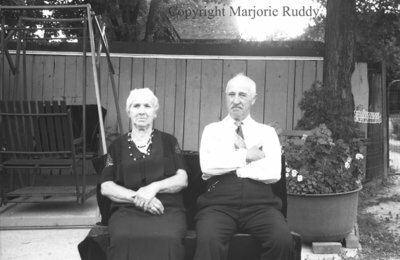 James and Alice Sawdon, July 16, 1939, Marjorie Ruddy. Whitby Archives A2013_040_811B.